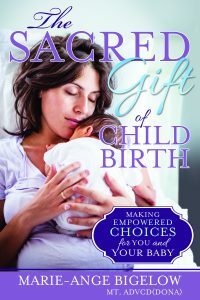 Back in February, Marie-Ange Bigelow, author of “The Sacred Gift of Childbirth: Making Empowered Choices for You and Your Baby,” contacted me and asked me to review her book. I was honored she sought me out and asked me, and readily agreed to do so. I must shamefully admit, though, that when she sent me the description of her book, I wasn’t that excited to read it. It sounded kind of boring, and I was worried about it being pushy in its messages. Well, I couldn’t have been more wrong. I could not put the book down! And my first question is, “Where was this book 11 years ago when I was pregnant with my first child?” My second question is, “Why was I never notified of risks verses benefits of medical interventions when pregnant with my first two children?” (I never got a chance to get given that information or choices with my third because I delivered him unexpectedly and very quickly at home). I am so grateful that I was able to read this beautiful book. I found out I was pregnant with my fourth child about a month after Marie contacted me, so reading it felt so personal and so relevant. The chapters were organized superbly by subject matter, with footnote references at the end of each chapter, as well as worksheets with reflective questions. Each chapter referenced a corresponding appendix, if applicable. The editing of this book was impeccable, with virtually no spelling or grammar mistakes. Though all this seems small, to me it was a breath of fresh air. The author explained everything in a way that even someone with no medical experience (i.e. me), could understand it. The book included well-rounded material, including personal accounts, stories from others, medical evidence (all cited), analysis of that evidence, and spiritual insight from prophets and apostles, as well as the author’s own personal testimony. Because all of this was included, and in a loving, respectful, non-preachy manner, I was able to be engaged and work towards my own change of opinion regarding childbirth. After the author explained medical evidence, such as risks and benefits of certain medical procedures, she always made easy-to-reference tables, that bullet-pointed everything. So, whether you are a reader who prefers great detail, or someone who wants the simplified version, you would be satisfied. Throughout the book, she reminds us of relevant points she made in previous chapters to tie in with current discussion. I found that really helpful. A lot of books I read, I have to go back and frantically search for information, but I didn’t have to with this book at all. 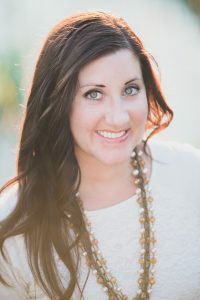 Even though the author has a clear and strong opinion about natural childbirth, she always made it clear that the decision is up to each mother and father individually. She stressed that doctors and others should not pressure you to do anything. You need to be in control of your own decisions. She also expressed that there is no shame if you must have medical intervention, and that it truly is necessary sometimes. She admitted the cases when natural childbirth didn’t necessarily solve issues, such as post-partum depression. The way she wrote and discussed different part of child birth, keeps the reader at ease in knowing that all points have been covered passionately, yet truthfully and objectively at the same time. As I read Bigelow’s book, I found myself having ah-ha moments as I related her experiences and medical references with the births of my own children. With my first child, Casey, I had an epidural, and though I had no pain and the labor was easy and smooth, I did not bond with him very well. In fact, when he came out blue, at a time I should have been concerned, I wasn’t. I was too drugged up to be concerned, or to really want to snuggle him and bond. I feel so guilty about that now. I also tore a lot, and he had trouble nursing. I had to supplement him with formula for a while. With my second child, Rigel, I had high blood pressure, and was told I needed to be induced. I was induced with Pitocin. They also broke my water, and I had an epidural. I remember the intensity of the contractions before I got my epidural. But, the epidural did not take away my pain. I still had a very difficult time, and towards the end, I had to have oxygen. I can’t remember why, but I think Rigel also was having some issues with his blood pressure. I loved him so much when I first saw him, but I tore a lot, and my recovery was difficult. I also had to supplement him with formula, and for a while, he choked a lot, which scared us. With my third child, Kamren, I didn’t have a choice in what happened. My labor wasn’t really a labor. I thought I was going to the bathroom, and ended up pushing out a child in a few quick, and incredibly scary, intense pushes. There was a lot of trauma with this birth, but it was natural. Everyone called me and my husband heroes. I don’t remember the pain, only the amazing love and concern I felt for my baby. I never had trouble nursing him, and my recovery time was really quick. To this day, three years later, I have an incredibly strong bond with Kamren. I can’t explain it, but it is definitely there. Because I read this book, my birth stories (the highs and lows), make so much more sense. I truly do wish to have a natural childbirth with this child as long as I remain low-risk. I have been advised to be induced a week early to hopefully prevent another scary, unexpected home birth. But now knowing the fetal distress that can happen from having the baby before he is ready to be born, I am not sure I want to do that unless it is medically warranted. We always say to moms, “The baby will come when he is ready,” but how often do we contemplate the opposite – that we shouldn’t make him come if he isn’t? I implore any woman reading this who is pregnant, or planning to become pregnant, whether with baby number 1 or 5, to read this book. My eyes were opened, and I feel much more empowered and educated about this most sacred time. Thank you, Marie-Ange Bigelow, for this gift.